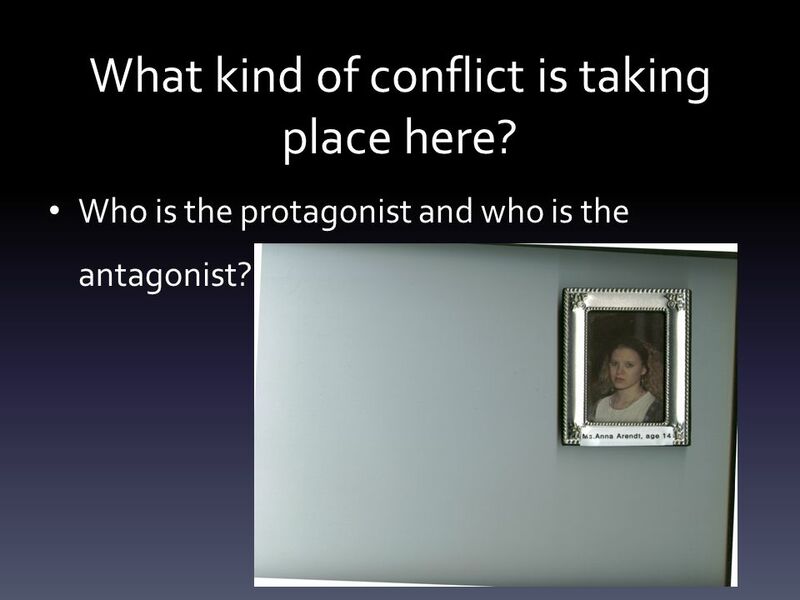 CONFLICT in Literature Objective: Students will be able to identify conflict in literature Do you know what conflict means? Can you think of any synonyms. 1 CONFLICT in Literature Objective: Students will be able to identify conflict in literature Do you know what conflict means? Can you think of any synonyms for conflict? 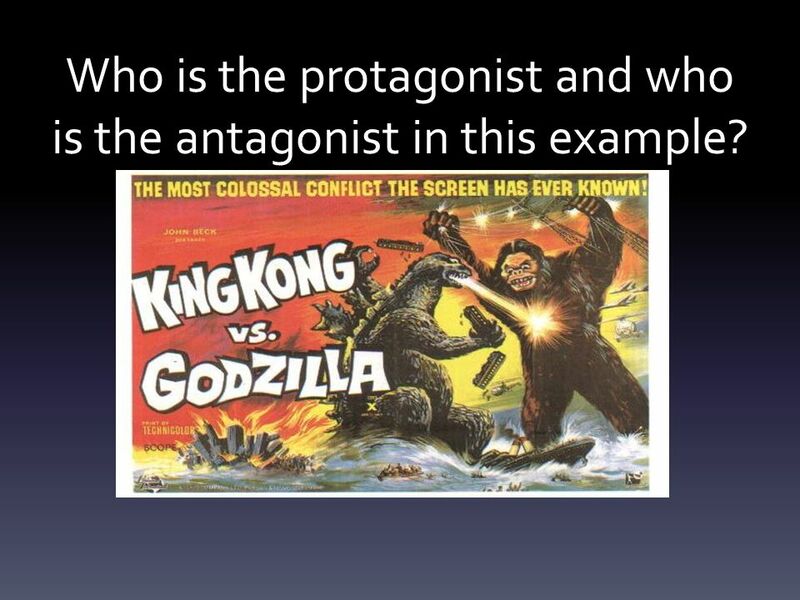 3 Who is the protagonist and who is the antagonist in this example? 4 Who is the antagonist and who is the protagonist in this scene? 5 What kind of conflict is taking place here? 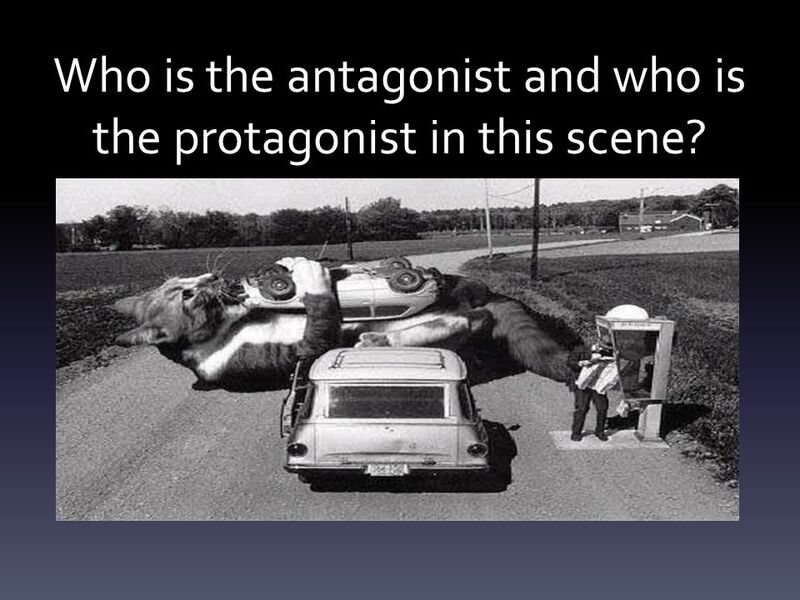 Who is the protagonist and who is the antagonist? 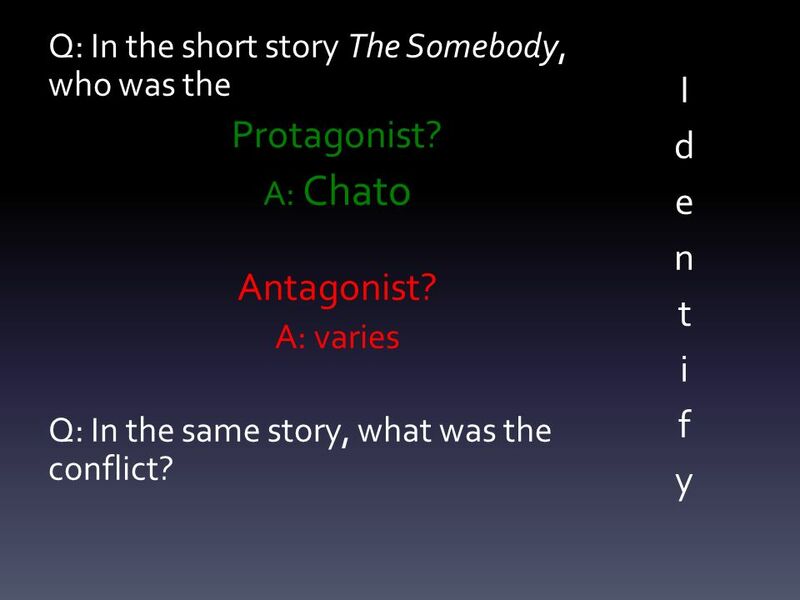 6 Q: In the short story The Somebody, who was the Protagonist? 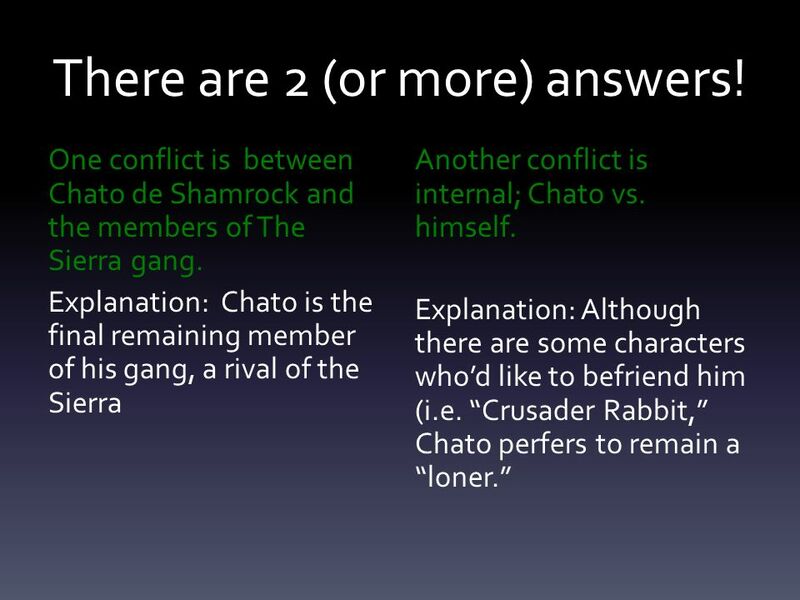 A: Chato Antagonist? 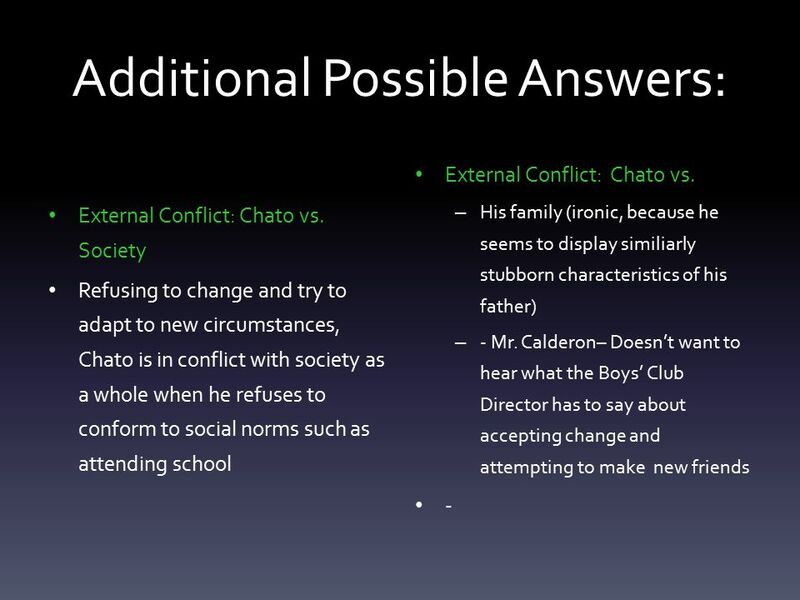 A: varies Q: In the same story, what was the conflict? 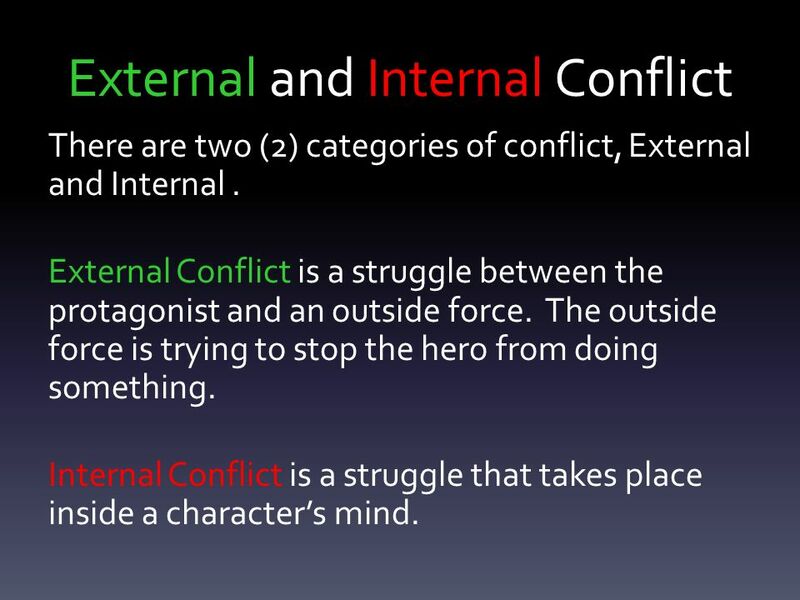 9 External and Internal Conflict There are two (2) categories of conflict, External and Internal. External Conflict is a struggle between the protagonist and an outside force. The outside force is trying to stop the hero from doing something. Internal Conflict is a struggle that takes place inside a character’s mind. 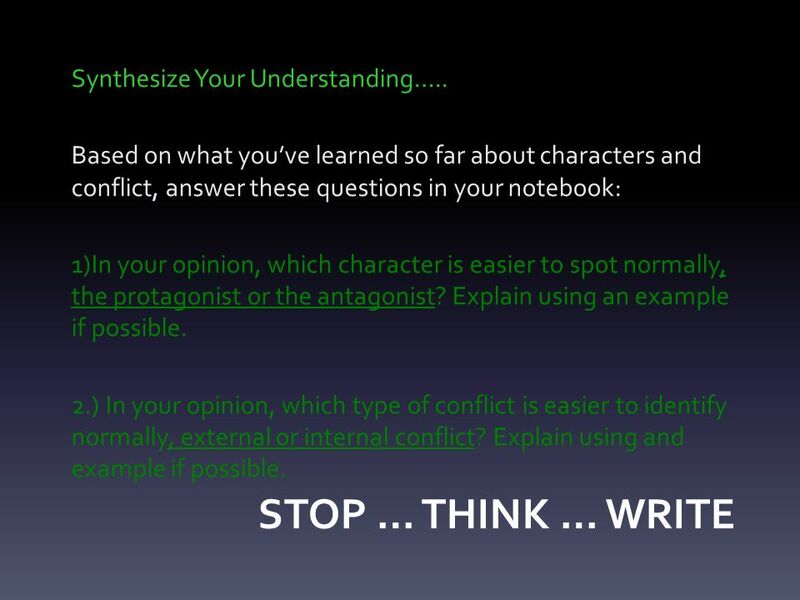 10 STOP … THINK … WRITE Synthesize Your Understanding….. Based on what you’ve learned so far about characters and conflict, answer these questions in your notebook: 1)In your opinion, which character is easier to spot normally, the protagonist or the antagonist? Explain using an example if possible. 2.) 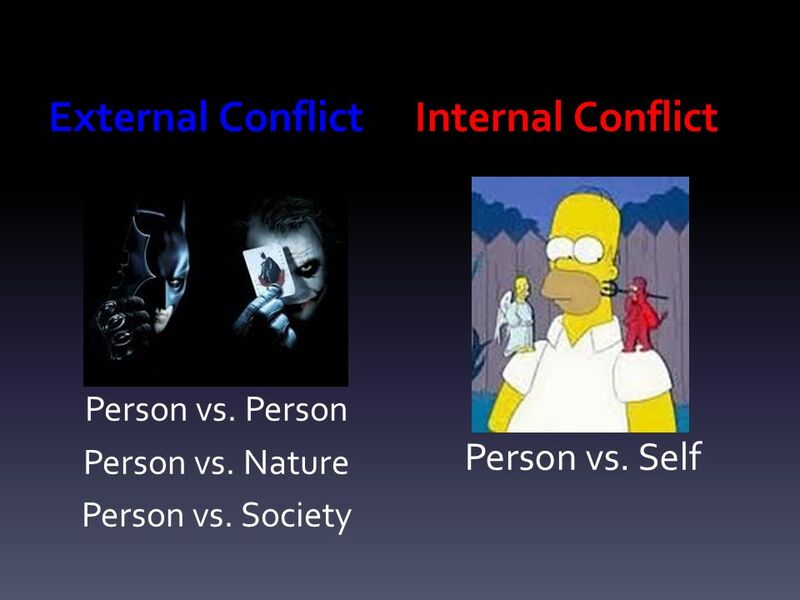 In your opinion, which type of conflict is easier to identify normally, external or internal conflict? Explain using and example if possible. 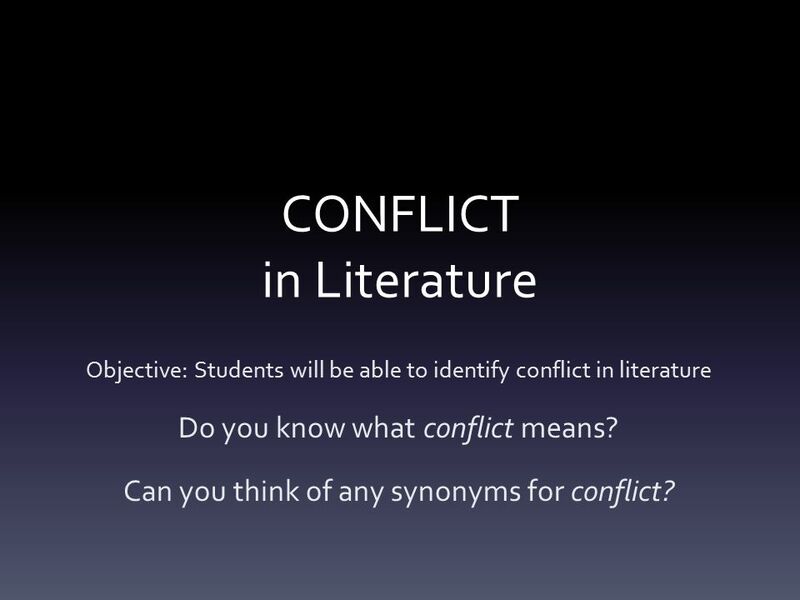 Download ppt "CONFLICT in Literature Objective: Students will be able to identify conflict in literature Do you know what conflict means? Can you think of any synonyms." Without conflict there is no plot, this is created around it!!! Visualizing Good readers are constantly visualizing and creating their own mental movie while they read. Do Now  If you could travel back in time to any period of history, where would you go, what would you do, and why?  Also, if traveling back in time could. 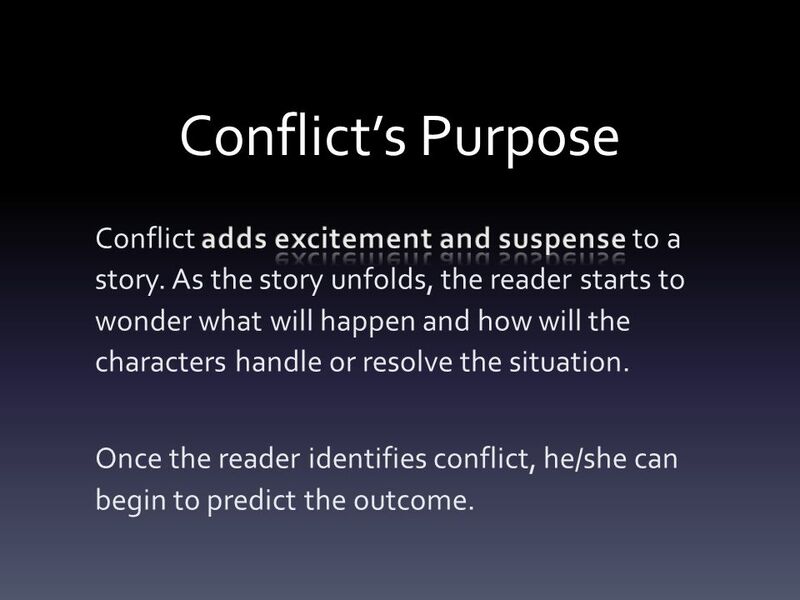 How does understanding conflict help you understand a short story? Conflict Definition: A struggle between opposing forces. Narrative Structure. Introduction to Narrative Structure: ps ps. Literary Terms and Techniques Please copy anything in WHITE into the Lit Term section of your binder. By the end of this lesson, you will be able to: identify conflict as it appears in literature. 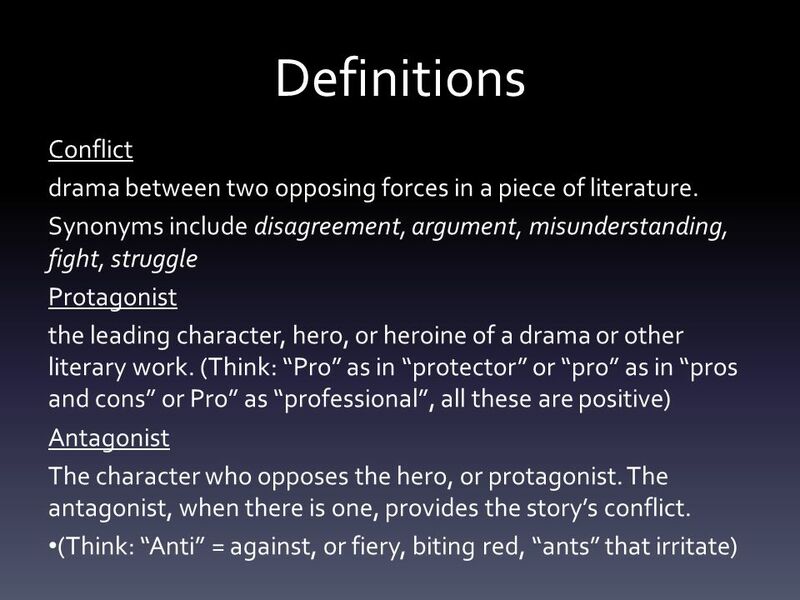 identify conflict as it appears in literature. distinguish. Warm Up Define conflict. In a brief paragraph, explain how conflict is important to growth and change. Provide specific examples based on personal experience. What does the word conflict mean to you? Define it in your own words. Literary terms for short story unit. Setting: The setting is the place where the story takes place. Geographical location Time period Specific room or. English 9H Ms. Bugasch October 7, 2013 “C” Day Goals 1.“Interlopers” vocabulary 2.To understand conflict: types and kinds 3.To discuss and identify the.  Conflict. Do Now: Silently, write in your Notebook  What type of insult would most provoke you? Explain why.  One about your dress or appearance?